I posted my answer to that question but then realized that my answer was just a part of the overall fix of this trade. I decided to describe my complete view on the entire fix if it was a trade of mine. Looking at the chart above I do not see this stock positively. 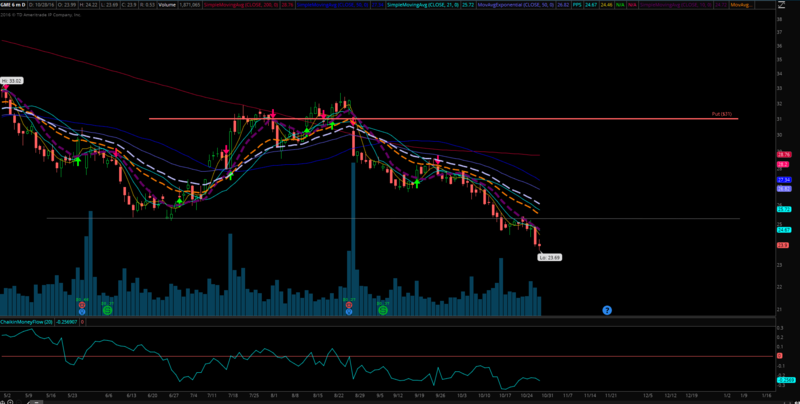 It may of course change but it recently broke through its support at $25.50 and I can’t see any support below. The stock may still continue lower, a lot lower. I think this trade was supposed to be fixed a lot earlier than now but many times it is difficult to say what is better – wait, or start adjusting. Since it is now deep in the money and there is not much optimism in this stock, I think it is time to start fixing this trade now rather than wait for later. Below I will list a few reasons why I think it is important to start fixing it now. Before we get to the steps on how to fix this trade, let me say a few words about a potential danger of the stock assignment. The option is far away in time (83 days to expiration). This is relatively safe for now and I doubt anyone sane would exercise this option early when it is this far away until expiration. However, although unlikely, it still may happen. You never know what the other guy on the other side of your trade is thinking. One reason for fixing this trade now is for the case an early assignment happens. If we can roll the trade down to 30, or 29 strike now, it is better to be early assigned at that lower strike than the current $31 one. There are many strategies available for this kind of trade which traders may choose from. Let’s review them. 1) Let the put assign, buy 300 shares of GME at $31 a share, and start selling covered calls. Some traders consider this the easiest and least troublesome possibility to deal with the deep in the money trade. And my own trading strategy is based on this same premise though. In my Strategy page I am describing my put selling strategy this way – sell puts as long as you get assigned, then buy the stock, collect dividends, and start selling calls as long as you get assigned. There is only one problem with this path. If you take the assignment, you will block your money in a trade which doesn’t look very promising as of now. You can get stuck in this trade for a very long time. If you are OK with it and do not want to explore more ways on how to play this trade then definitely take the assignment. I take the assignment only as the last resort when nothing else works or if I get assigned early. If there is a slight chance to avoid an assignment and turn the lemons into a lemonade, I go for it. The trade is still far away in time. The expiration is in January 20th 2017. You can decide to wait whether the stock recovers or not. Many of my own trades got deep in the money recovered nicely later on. You can choose to wait until the end of December 2016 and roll or adjust this trade early in January 2017 if the stock stays this low. The only difference I see here compared to my holdings which went deep in the money and recovered was that they were way above their support, went down to test that support and recovered. This stock actually broke below the support and there is none underneath this one. No one knows where the buyers step in and start buying again. Another problem with waiting is that if the stock really continues lower, your put will become even deeper in the money and rolling could get a lot harder than it is now. And with deeper in the money put, the risk of early assignment will increase. Although an adjustment I am going to propose will not remove the assignment risk nor improve this trade all at once, it will at least improve this trade. But more steps will be needed to turn this trade around. You can also decide to close the trade for what it is and move on. Currently, the option is trading at 8.90 (ask price). The trader collected 5.65 credit. Closing the trade would create a $325 loss per contract, total $975 loss. I am not a person willing to take a loss. 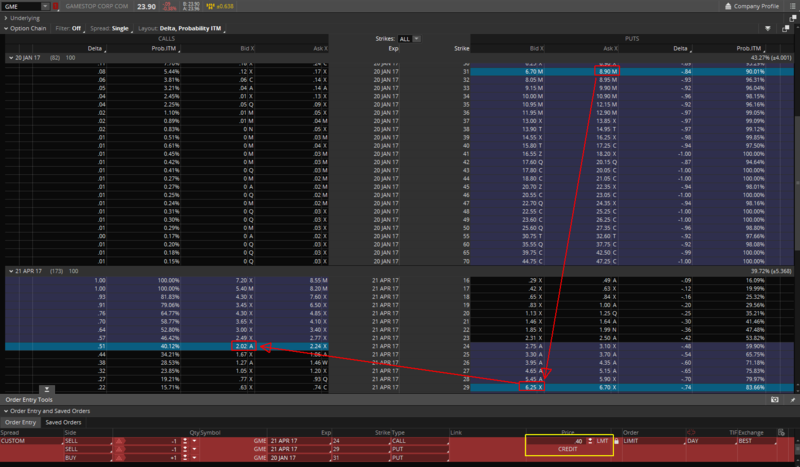 I would rather accept the challenge this trade offers and play this option trade. There still will be plenty of time time to take losses if nothing works. But not today though. This is a step I would choose if this was my trade. It will not solve all the problems with this trade immediately but it will improve all its odds. More steps after this one will be needed to end this trade as a winner. This is just a first step of squeezing the lemons. Why converting this trade into an inverted strangle? 1) Make the trade a credit trade. 2) Collect more credit to offset any future losses should they occur. I trade options as a seller of premium. That’s my rule number one. Therefore I refuse paying for options on the net basis. Thus my adjustments must be credit trades too. If you look at the options chain, you will see that the put is so deep in the money that it is no longer possible to roll it for a credit. You may choose to wait and see if in early January you will be able to roll for credit but you run a risk of being assigned at a very high price. Rolling this trade as a credit without some help is impossible. An inverted strangle provides such help. To buy back your $31 strike put you would have to pay $8.90 dollars per contract. There is no other available lower strike in January 2017 or April 2017 which would offer you more time value to offset the cost of the puts. From this perspective, this trade is pretty much done. Over. You cannot do anything about it except wait whether it improves or not, close it for a loss, or take assignment. An inverted strangle would help us to roll this trade. I am simulating this trade with offline prices, so in Monday when making this adjustment you may need to adjust the trade to still make it a credit trade. You may even sell an ITM call (23 strike in lieu of the proposed 24 strike). Making this adjustment we were able to lower our put from 31 strike down to 29 strike and possibly collect $40 dollars credit. This improves our position if we get assigned. Now if the assignment happens, it would be at 29 and not 31 a share. Better. We also moved our trade into April 2017. We can also decide not to roll it and stay in January expiration but we would have to move our calls more in the money. This adjustment may look appealing because you keep your existing expiration which may help in future rolling due to faster time decay, but it has a problem that this would require us to go further in the money with our call option which may make our next adjustment steps a bit more complicated. 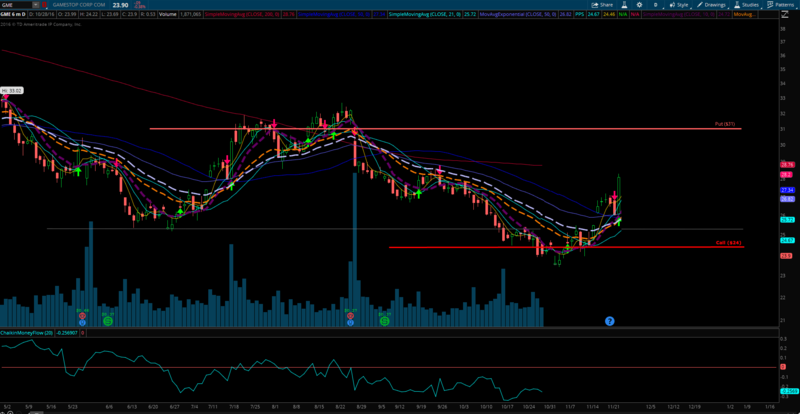 So I would rather choose moving it into April as of now so our call stays ATM or slightly OTM. I will explain reasons later when explaining money management of this trade. So let’s say we choose to move the trade into April. This part is important because this would help us with further trade adjustment. It requires a bit out of box thinking on how you will be looking at this trade next. It also has a huge psychological effect on your mind. That’s why I look at the trades differently and always from the positive perspective. Our ultimate goal of the inverted strangle with ATM calls adjustment would be to eliminate our calls as soon as possible so we can use them again without piling up naked calls. We simply want to get rid of the calls. Let’s take a look how we can do it and make it all look great in our books. We collected $5.65 total credit per the original contract. The new adjustment brought us another $0.40 per contract. Total, we have a new $6.05 credit per contract. Now we need to act a bit like a US government and perform some “wealth” redistribution. We will move some credit from the puts into calls to treat both legs equally (although they are not). Now we can immediately place a buy back order for our calls at 50% of collected credit or 1.50 debit. The current closing price of those calls are $2.24, so we are not that far away from our closing price. And now we are done for the day. Now we have to wait. If the stock stays flat for the next few days or a month or goes even lower, it is OK because our calls will lose value and we will be able to close them for a profit. If we say that we had $3.00 credit in our call side, we close it for $1.50, we can book a $1.50 credit gain on calls and forget them forever. This profit will no longer play any role in our trade. 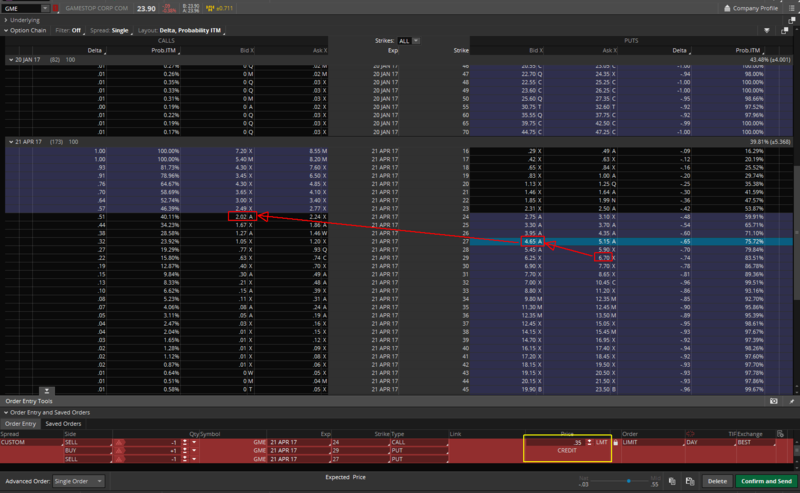 We are now left with 3 short contracts at 29 put strike and we have $3.05 credit in this trade per contract. Since we no longer have calls available, we can repeat the entire process of lower our puts and selling new calls against it for a new credit again. Now we can do the same “redistribution” to get rid of the calls if we want, but the trade is now in a lot better shape than before. We can afford to wait and next time try to roll puts only without a help of selling calls against it, so if we happen to get rid of the calls, we will have 27 strike puts and maybe we will be able to roll them into May 2017 without selling calls. This is too early to say. Now let me disclose one thing. All the prices above are as of today but the real world doesn’t work that way. If on Monday we start making these adjustments, the prices may be completely different than those shown. Also our second adjustment may have a totally different outcome and it may not even be available as shown and it would have to be done differently. Therefore this post describing the proposed adjustment is only to show the intent and scope of this process and the reality may be different. I plan on opening this trade in my paper money account tomorrow and start doing all those adjustments and post them here to show the real life results (to the extent of paper money account features). Let’s say that after we do our first adjustment and lower our puts down to 29 strike and sell our calls at 24 strike, the stock shoots up and starts rallying. If something like this happens, we will have our puts in the money and our calls in the money and we still have an inverted strangle. If this happened after our first adjustment, we still will have $6.05 credit in the trade. If this happens after our second adjustment, we will only have $3.40 credit in our trade. In this case we will treat the inverted strangle as we should. We will not be rolling it, but we will be rolling as is into the next month. We want to wait at least one month before we roll the entire strangle. In this case we can let the trade close for a profit and move on. You can decide to let it go for 40 dollars credit or roll the entire strangle into the next month (note, you want to roll into a monthly expiration, if you choose weeklys, still roll 35 days until expiration not shorter). If you decide to roll into the next month, you will probably collect another $1.10 credit and then you let it expire in the money. You will be out for approx. $1.50 credit (or $150 dollars) over all. We just turned the lemons into a lemonade. Of course this will take time. The real life prices will look different than those I used here as an example, but as I said, I will continue tracking this trade in my paper account and post the adjustments in real life for all of you to see. Great article! 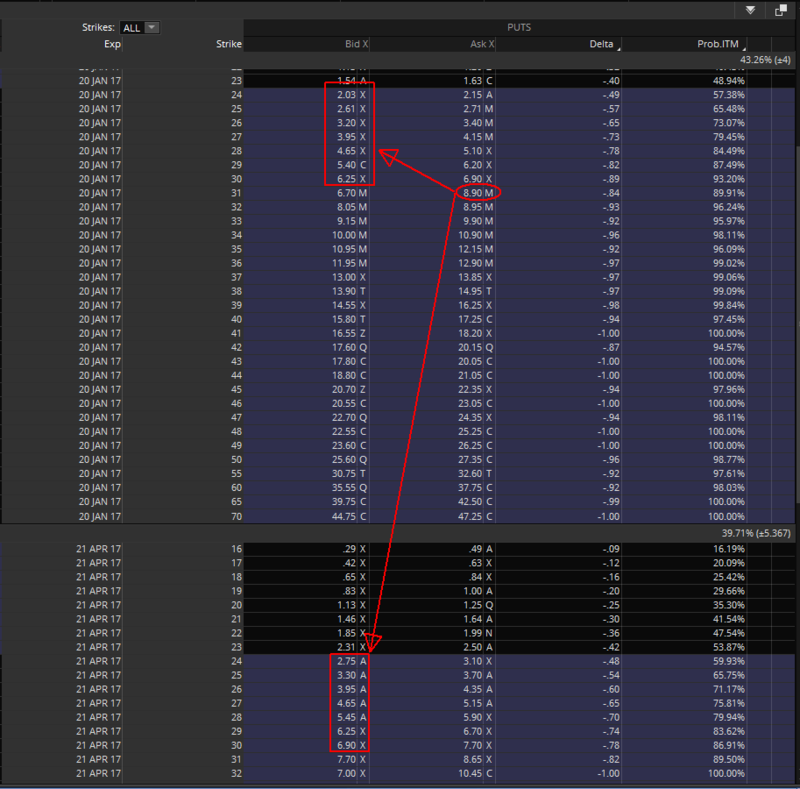 I have a few ITM puts that I have no idea what to do with… This is a good example. My issue with this strategy: it is not always easy to roll up the calls… Any thoughts on that? When calls are un-rollable I always convert them into in the money puts and then roll those puts as those are easier to roll. Sometimes this poses an effect of spinning the wheels as this can bring you back to the beginning of dealing with ITM puts. 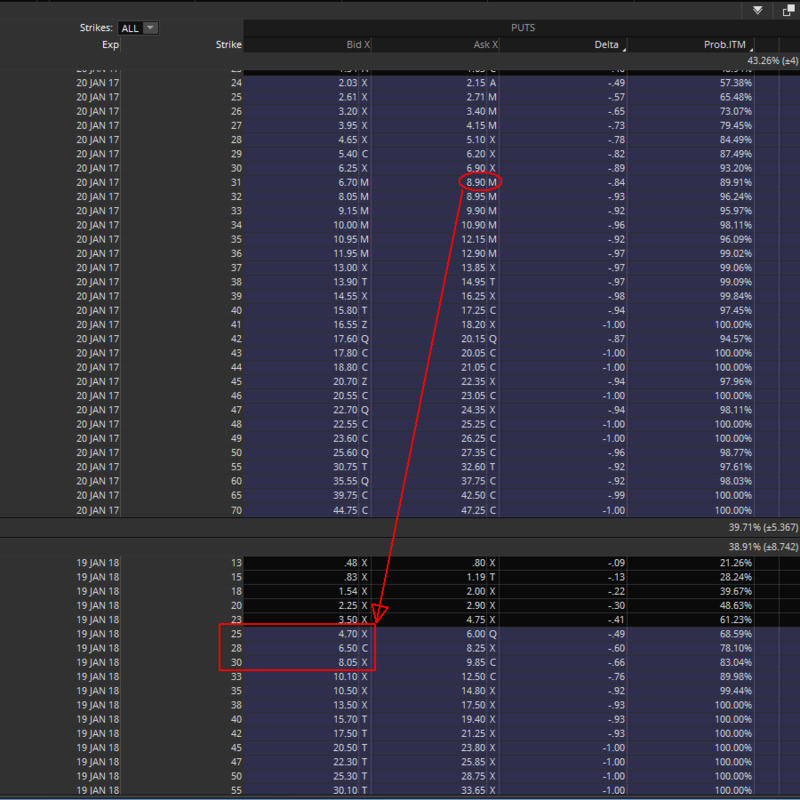 But so far I was lucky when converting into puts as the stock usually went higher and those ITM puts became OTM. Great article, it made it really clear on how you manage the trades. The money management part is something that I did not consider at first, but it’s where the whole strategy pivots.